A man runs. He falls down. He struggles back onto his feet and he runs some more. It’s a simple narrative. Even without much detail, you can understand what’s going on. Pause the video, though, and the scene isn’t nearly as clear. Movement makes up for the lack of other visual information. Your brain can read and understand a video at much lower resolution than it would need to make equal sense of a still frame. Meet Jim Campbell, a former Silicon Valley engineer turned visual artist. Inspired by early Bell Labs experiments with pixelated images, and by his own engineering work with digital filters, Campbell makes art that toys with the human brain. Much of the inspiration for Campbell’s current work comes from a story in that magazine, written by Bell Labs’ Leon Harmon, about low-resolution images and the minimum threshold of information the human brain needs to recognize faces. The now-classic example Harmon used was a 252-pixel, grayscale portrait of Abe Lincoln. Since the ’70s, plenty of artists have worked in pixel mosaic, but Campbell was more attracted to the the question Harmon was asking: How low resolution can an image or video be before we no longer recognize what’s going on? To see it in action, just look at a still image from the “Running and Falling” video. The extra information of movement makes all the difference between completely clear, and completely abstract. The other big thing Campbell has noticed is that low-res images–even moving ones–make a lot more sense once you’ve put them through a filter. At the end of the boxing match video above, Campbell comes into the shot and removes a plexiglass panel, revealing the blinking LEDs underneath. Suddenly, even if you were getting the idea of a fight before, the image loses most (if not all) of it’s meaning. Filtering is important to Campbell’s art. The idea is based on what he used to do, back when he was a full-time Silicon Valley engineer, with digital reconstruction filters for processing sound and images in a computer. According to Campbell, a digitized image has a “stair step” effect. It’s essentially broken into a bunch of individual pieces of information that are next to each other, but not really connected. Reconstruction filters take these pieces and smoosh and blend them, combining a bunch of separate dots into a coherent whole. “I took that idea and just created an optical process, instead of an electronic one,” Campbell says. He does this in several different ways. Besides the literal plexiglass filter used in the boxing match video, Campbell has also found that simply turning the art away from the viewer can have a similar effect. That’s what’s going on in this last video. 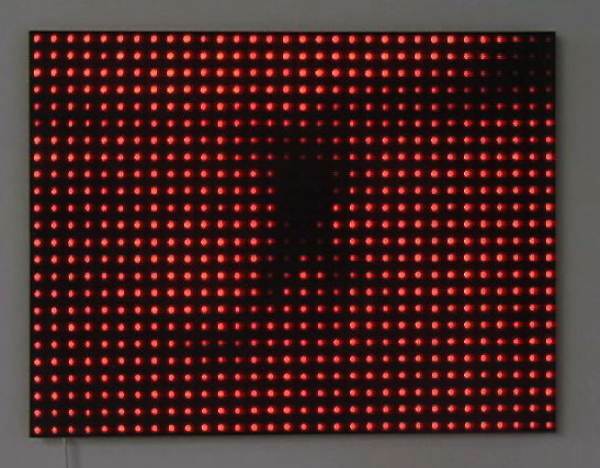 Campbell has a square panel, with LEDs around the edges of it. He hangs it up, with the lights facing the wall. Instead of seeing the individual dots of light, you see the smoothed out, low-resolution video projected on the wall. If you didn’t know ahead of time that the piece was cycling through scenes of a fire, freeway traffic and a walk through a park, you’d probably still have trouble understanding what you were seeing. But without the filter, you’d likely never get it.